Livable Phinney argued, based on actual arrival times of Metro Route 5 the location of the future apartment building failed to meet the definition of frequent transit service. Rather than basing frequent transit service on actual arrival times, the Seattle Department of Construction and Inspections (SDCI) and SDOT recommend clarifying the definition to use published scheduled arrival times. The new definition would also be more ‘flexible’ the city says to allow for headways up to 18 minutes. Bryant said frequent transit routes still average four buses an hour in one direction and rarely exceed 18 minutes headways between arriving buses. A study done by Capitol Hill Housing found in the Capitol Hill neighborhood the residential overnight vacancy rate was as high as 33% in some buildings. That figure is similar to the findings of a Metro parking study, which found that approximately 35% of residential parking spaces were not in use in the 95 Seattle buildings the transit agency sampled. This move would allow parking spaces to be shared among short-term parkers (shoppers) and long-term parkers (residents). This is also a recommendation in the city’s Housing Affordability and Livability Agenda (HALA). Livable Phinney has remained a vocal opponent of the proposed changes. One amendment Livable Phinney is advocating for is a “car-free-lease requirement,” which would prevent tenants from parking cars in “overcrowded areas” (where more than 85% of on-street parking is utilized) if the developer failed to provide enough parking to meet demand. The city does want to require the unbundling of parking space rentals from housing lease agreements, which the city says can lead to lower rents. Parking along Greenwood Ave., lined there with a mix of low-rise mix-use buildings, other single-story retail and single-family homes, is currently free but limited to 2 hours. Off the arterial, the neighborhood streets are mostly filled with single-family homes, many with off street parking. A public hearing on the proposed changes was held Wednesday, February 21 at City Hall. Transit advocates supported the proposed changes. Councilmember Lisa Herbold, who sits on the Planning, Land Use, and Zoning Committee, in a blog post continued to question the correlation between transit ridership and a reduction in car ownership. The committee is expected to take action in March on the proposed parking requirements. I work for a real estate developer, and we build buildings without parking in neighborhoods such as Phinney Ridge. I believe in what we do, and our buildings are great. But that’s besides the point. My point is, I love the idea of tying car ownership to leases. If you have a car, you shouldn’t be able to rent in an apartment that doesn’t have parking. If a developer builds a building with no parking–the onus should be on them to find tenants that don’t have cars. This would do two things. It would drive down the price of rents, because let’s be honest: there are less people without cars than with cars, and that shift in supply and demand in our free market would lower the rent to the point at which it becomes affordable. Thus completing the secondary goal of decreasing car ownership in the city as some people would forgo their cars in order to rent more cheaply. In this regard it’s less about NIMBYism (which is bad) and more about facilitating urbanism (which is good). And to clarify, I think this goes for people who own houses as well. If you own a car you should “own” a place to park it–whether you use it or not. For example, if you own a modern townhouse with no parking, or a bungalow on a lot too small for for a driveway–no car for you. Needless to say, Liveable Phinney are not proposing that the owners of prewar bungalows be required to provide off-street parking for their cars. When I bike and walk on the side streets of Seattle, I appreciate how narrow they get with cars parked on both sides. It keeps traffic slow and limits the attractiveness of cut-through driving. Anyway, major changes in street-parking regulation affecting existing residents would be unpopular and unlikely. Regulations affecting only newcomers would be clearly unfair, and we don’t even have a framework that sort of thing outside RPZs — “residential” street parking is, in general, fair game for anyone in most of the city. I think this discussion needs to focus on a condition that’s already well underway; Urban or rural, every additional car assures that fewer cars can move, at progressively lower speed. Garage or street parking, fastest part of a day’s driving could be from parking space to nearest arterial. So it’s time to separate both discussion and car itself from residence. It could be that as a rule, the farther the car is parked from home, the better the transportation you’ll get from it. And the longer its life, from not being forced move through its own worst operating conditions. Above links- two ideas. First- small (not tiny) houses, arranged around a large shared yard, vegetable gardens encouraged. With a single line of assigned covered and sheltered parking spaces. Exactly like the ones at .my apartment building. Greenwood, across the road from Shoreline Community College. Route 55, terminal across street Go see it. Second link, indoor garage where your car is stored. And also maintained. And also delivered and picked up by staff, wherever you phone from. Including most convenient transit station. Two examples. Nowhere near only ideas. All or none of which will require major reworking of the city’s whole transit system network. Seattle has already been under construction for a very long time. Exactly like present system, everyone living here will have to pay for it. Which it should start repaying on its first operating day. But one assist on the expense: money re-assigned from parking. We’ve already got millions of dollars in transit capital: City street lanes are built to a much higher standard than parking garage floors. For which they’re now being used. That sounds fair enough. But a car owner should be allowed to live in a building without parking, provided he rents a parking space separately from an adjacent building. The main thing is that he is paying for somewhere to store his car, without depending on the city to subsidize his car storage. It would also be nice if those who didn’t own cars had the ability to rent a parking space in their building for their personal storage. If there were enough demand, an industry would develop where you could buy or rent enclosed, lockable storage units, perfectly sized to convert any traditional parking space into a mini private garage. In other words, the benefits of the square footage of a parking space shouldn’t have to be tied to parking a car there. How much (using a hypothetical of the Phinney building described above) would rents be lower than a similar development with parking? $100 a month? My building in southwest Capitol Hill has always had unbundled parking, and it was $100 when I moved in 2011 and is now $250. 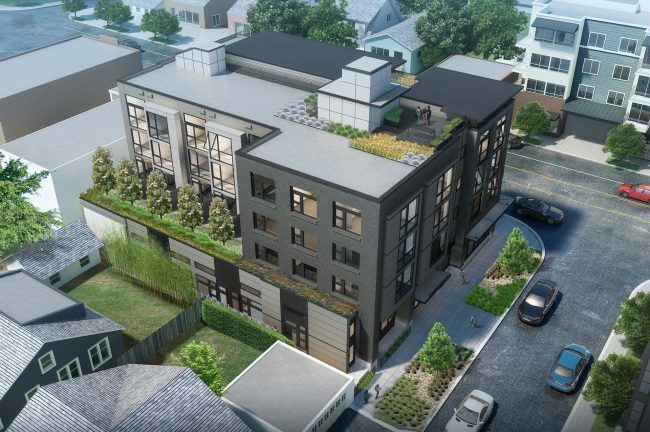 It may be a bit less in Phinney Ridge given the location (further from downtown) and type of building (smaller, lower-end units I gather) — the wealthiest renters won’t compete for those units. Or it may even be $250 because the market will bear it. As for rent dropping by that much, ha ha ha. It would be interesting to see what happens if buildings with existing bundled units are forced to unbundle them: will the lower the rent by the full amount they charge for the parking? They may have to initially to pass the laugh test, but they can probably make the rent creep up at least partway over the next couple years. Then there’s the issue of empty parking spaces: the owner will have to spread the cost to all renters because there’s nobody else to charge it to. But remember the fundamental rule: rents go up and down based on the vacancy rate and the average affluence of renters, not based on the cost of parking or taxes. I agree with you in principal but doesn’t unbundling apartments from parking spots do the same thing? Presumably it should drive down rents as the income is made up by charging for parking spaces separately. This is overreach, and doomed to be gamed. So I can move in and start a lease if I own no car. What if I buy one later? Are we going to have the car-owners-in-apartments police monitor if I buy a car AFTER I get my apartment? Does this idea apply to anyone who already owns a house without off-street parking? Let me take a WILD guess and say that the 2 or 3 car-owning home owners behind killing the project will somehow, miraculously be saved from such city interference. Funny that. Sorry, but cities are crowded, dense places. That includes cars. The disincentive to owning a car should be real, but it doesn’t need to be legislated. It simply occurs. Turn parking into bike lanes where appropriate, put the roads on diets, prioritize transit with dedicated lanes, signaling, etc. Residents can make their own choices about car ownership in that context. In Tokyo, you can’t legally buy a car without documented proof of a place to park it. It can be done. It would require a new administrative structure to register where every car’s “home” parking space is and whether people are compliant. To some extent it’s like the German law that you have to register your address with the local police whenever you move. Americans would howl over that, even though driver’s licenses and voter registration give somewhat the same information. So Americans would howl over car-parking registration even though technically it would be a small extension to car registration and annual car tabs. This state doesn’t even have a mechanism to collect income tax, and they’re going to set up an enforcement system for mandatory home parking spaces? Then there are the thousands of people in pre-parking houses and apartments built before the 1940s. Will they have to give up their existing cars? What kind of legislature demographic would pass that? I don’t understand your position. You seem to be arguing for an arrangement where the government gives away free car storage space to some area residents, while other area residents are banned from accessing it. What possible criteria would justify this discrimination? >> If you have a car, you shouldn’t be able to rent in an apartment that doesn’t have parking. Sorry, but that is ridiculous. If I like to swim, must I find an apartment that has a pool? I was planning on using the public pool, but it sounds like the folks there are tired of all these new neighbors crowding the pool. Parking is not a right. It is simply something you like to do sometimes. If you want to reserve (or build) a parking spot, go ahead. If not, then live with the consequences. When I rented in Capitol Hill, I made sure that I sought out and rented an apartment that provided parking. As walkable as the neighborhood is and as convenient as bus service was, even as far back as 15-20 years ago, sometimes I did not have the convenience of working downtown and had to work as far out as Snohomish County, which necessitated the need for a car, which I used primarily for work. Furthermore, Capitol Hill, as many of you know, has minimal street parking available at pretty much all times of the day, so a reserved parking space, even with a monthly fee, was an absolute necessity. Now, I live in a home in West Seattle with one parking garage and two cars for two people. Fortunately, the street parking isn’t too bad. And I much need a car—it’s spread out and one has to drive a mile or two to get groceries. If parking in this neck of the woods started to become very sparse due to our rapid growth, I wouldn’t mind my neighborhood streets or much of the peninsula getting into the Restricted Parking Zoning program, like some North Seattle neighborhoods (U District, Wallingford, Queen Anne Hill) so visitors, who occasionally remain parked in a particular place for a very long time, can keep their cars moving and make space for the neighborhood residents. >> When I rented in Capitol Hill, I made sure that I sought out and rented an apartment that provided parking. Exactly. That is how it should work. I went house shopping with someone I know and parking was an issue. They owned two cars, and expected to use them. Not to get to work, but to get around. For him, this was a big issue, for others, no big deal. The city should simplify the rules further by getting rid of parking requirements completely (and not worry about the transit situation). If the city really needs more parking, then we all should pay for it, not just renters. Or ban off-street parking in new developments. If we think global warming is real, it is kinda crazy to build more car infrastructure. But then again, I’m still shocked we’re expanding the airport when each passenger going through literally outputs a ton of carbon. Or ban off-street parking in new developments. To state the obvious, this is grossly immoral. We’ve decided that free car storage on government land is a public good, of sorts. What you’re suggesting is restricting access to a public good based on an irrelevant and arbitrary division–how old your building is, how long you’ve lived here. It’s like suggesting there be a special freeway lane or restricted hours at parks that are only for use by people who’ve lived in Seattle over 10 years or something. Discrimination based on length of residence has no moral basis. Umm, what? OFF-street parking. No parking OFF of the street. As in, you can’t build a parking garage or a parking lot, or even a driveway. I expected to take flack, but not for an opinion I never held. I would like to see small garages in neighborhoods like Wallingford as a replacement for street parking in small commercial districts. Theoretically that could also work in residential neighboroods to nullify the space taken by house garages and driveways (which take up one street parking space each), but those would have to go in when the neighborhood is built and it’s too late now. But a city-funded or neighborhood-LID-funded garage would seem like a way to break the stalemate that you can’t put transit lanes on 45th because the neighborhood would howl that the businesses would go out of business if their customers didn’t have cheap convenient parking. The solution is obvious: cities should not give free parking to anyone, for any reason. We can and should charge people to store their automobiles on public rights of way. The article says that a single parking spot can add up to $500/month cost in rent. There’s about 750 hours in a month. Charging $1/hour for parking on all city streets seems like it would cover the costs. Of course the NIMBYs in houses who have relied on leaving their cars on the streets for years will complain about this idea. But why should they have the right to store cars on public streets while new residents do not? This is the solution. If street parking costs as much as a space in a private lot, demand for paid parking will grow, and we won’t have to regulate via parking minimums. Zone parking passes should cost $500 so the city can get the most out of its right of way assets. Hey pal – It’s sweeping, condescending, petulant comments like this that make me hope you fail…and I happen to agree with you! Let other people with a better style of persuasion lead this. You’re better sat in back, politely applauding, instead of screwing your side over with your poor presentation skills. What? It was a blog comment, not the beginning of an orchestrated campaign. Stop insulting me. I don’t care if you agree with me or not. Folks Should Pay, Seattle Transit Blog encourages regular commenters to attend Sound Transit Board meetings to learn correct ugly and barbaric presentation skills from the three regular testifiers who see to it that the list never gets beyond three. Think of it as a test to be sure commenter is not a Russian ‘Bot, who wants AP to beat Bernie Sanders. Or an agent of Sound Transit Intergovenmental Communcations, who invariably use courtesy to conceal the real spirit of public transit. So lighten up and get back to the War on (Parked) Cars. And AP, what’s insulting about starting an orchestrated campaign? They’ve got their applications in all transit discussions. The increasing degradation with the #5 bus to serve Phinney could be mitigated by 1 Bus Away being more accurate. The bus is occasionally ahead of schedule (not excusable) and usually late. It is likely to get worse when the down town construction messes up Alaskan Way, the Viaduct, 1, 3, and 5th (?) avenue. If I knew when the bus was coming I would literally set a timer and walk out to the stop a couple minutes early. I know what you mean, but as I understand it OneBusAway relies on data provided by Metro, as do all other apps, Google Maps etc. So blame Metro’s vehicle location service / transit feed. And honestly I’m not sure how complex this feed is and if any of the apps combine location with historical data or current traffic conditions when attempting to estimate arrival times. Or if the feed does all of this and the apps just present the arrival time as published by Metro. The system TriMet uses currently uses the schedule data to determine how long it will take to go through a certain area. I’m pretty sure these all work the same. One of the common reasons given for people still owning cars in Seattle is not to commute, but to “get out” on weekends. Many of those destinations have free or really cheap parking (like $30/year for unlimited parking at state parks). What if those trailheads and parks charged serious $$ (like near-stadium prices) on weekends? Yes, I know this akin to the National Parks huge fee increase that was criticized by many. But… to be serious about tackling the car ownership issue, cars need to become undesirable in ALL situations, not just the use cases we don’t like (driving to work, or to the huge surface lot Safeway in your neighborhood, etc.). You’d need to massively expand Trailhead Direct bus service to provide an alternative. Does anyone know how the ridership was on those last year? I’ve never tried it. From what I recall it only served a couple of trailheads and Issaquah TC, which was pretty hard to get to from Seattle on weekends via transit. Why not charge more for the on-street parking spots within the city instead? That would also cast a wider net rather than punishing a single group of outdoor enthusiasts (and doesn’t require coordination from agencies outside of Seattle city control). That is of course the first step. But any on-street fee will be a trivial amount of money for the average car-owning Seattle household. Even $1000/year (no chance it would be that high, politically) for an on-street parking sticker wouldn’t radically change behavior. It would probably incentivize some people to put gravel in their backyards and clean out their garages. But they will still own the car. Once you own the car, driving it around is relatively cheap largely because parking is badly underpriced most places that aren’t home or work. Many recreational sites are overcrowded in the summer and parking is at capacity, which suggests it is too cheap. I don’t understand your suggestion: what are you suggesting when I want to go to the store to get 8 bags of groceries. Rent a car? Pay $15 in parking fees? The solution is to not buy 8 bags of groceries in 1 trip. Instead of 1 giant weekly supermarket trip, make 2-3 smaller trips throughout the week. More frequent small trips also reduce waste and encourages buying more fresh food. I’m car-free and am lucky enough to pass by a couple of supermarkets on the bus route from work to home. I bought a few large Ikea bags (seriously the strongest bags I’ve ever used), and do my grocery shopping on the way home from work. @Larry, I don’t like that solution. Every trip to the grocery store has some overhead in terms of time. It only increases when (like me) you don’t walk right by it on the way home. I don’t enjoy spending time at the grocery store, so I want to minimize time by only going there once every week or two. It’s fine if you want to do things differently, but please don’t say everyone should be doing it like you. I did 2-3 smaller grocery trips a week when I lived in Capitol Hill since there was usually a supermarket within walking distance of my apartment and or my condo. The spread out nature of West Seattle doesn’t afford the convenient walkable distance to supermarket, so I’m doing the big kahuna grocery trip in one shot. 8 bags of groceries? We’re a family of 4, and I’ve never bought more than 3 bags on our weekly trips. Can easily fit in my e-assist cargo bike. Uber or Lyft maybe? I do not currently own a car and will use Uber or Lyft to make runs to Costco. I also use them for trips to my local grocery store when I don’t feel like walking back with a bag or two of groceries. Note that with using Uber and Lyft along with occasional car rentals I’m still coming out ahead of owning. I find most people who own cars really have no sense of what it really costs them. The extra cost of ownership of a car (a used 2000 make w/ 140K mileage) is worth the time saving of waiting for the uber or the lyft to take you to and from the supermarket and worth the time saving of d*cking around with paperwork at the car rental place as well as not having to worry about getting a rental dinged up. The control aspect of getting into the car immediately when needed and getting the task done as opposed to the intermediaries of apps, waiting around for car-shares, sometimes for long periods, and dealing with bureaucracy is worth a few extra bucks. Keep in mind, if we had NYC or London level transit availability and convenience, I would be truly without a car, meaning no car shares or car rentals, in which you are really using a car, but you don’t own it. East Coast Cynic: completely agree. How reliable is Uber and Lyft if you come out of Costco with a large load? How long do you have to wait, and do you ever feel stuck and “How will I get this stuff home”? I don’t believe that this is more than a small fraction of car owners. A lot of people drive to shop or attend after-hours activities even if they commute on transit. And if they’re paying $200 a month for a car that they use one or two days a week, well, they can see how much it’s costing them. There are people who move to Issaquah because it’s close to the mountains, but that has little resemblance to the Seattle situation. You don’t get 8 bags of groceries. People didn’t do that before the 1950s: they shopped every day or two at stores within walking distance or a short streetcar ride away. I’ve never had a car, and I just keep two canvas bags in my backpack, and that’s enough to carry a lot of groceries on the bus. I shop at a lot of different stores because I get certain things at produce stands, others at Costco, others at a coop/Whole Foods, and as a last resort QFC/Safeway, so I travel more than most people. If you go just to one supemarket it would be easier. “But what about people with families?” Well, in inner-city Boston people use delivery services or take a taxi from the supermarket. Remember that a car costs $8000+ a year in gas/maintenance, plus $2400 for structured parking. That can buy a lot of short taxi rides or occasional Uber/Zipcar to supplement transit use. There are three reasons that 8-bag grocery trips became common. One, people had cars and wanted to go to lower-priced supermarkets rather than neighborhood shops. Two, the stores pushed more of the storage responsibility onto them by switching from bulk goods to packaged goods in ever-larger sizes. Three, people started consuming more food and other products, so there was more to fill the bags. The first was public demand, and a failure of society to address it in a non-corporate way. The other two were marketing strategies to push more product and to offload the cost of product storage onto consumers. In principle I hate app-based delivery services because it seems like stupid idleness for people with money to burn (“You can’t go get a pizza or tandoori chicken or lettuce?”), but in another sense it could turn into a successful delivery network for carless households, as people in denser cities have long done for family groceries or furniture etc. And as asdf2 pointed out, you can get a year’s worth of toilet paper and laundry detergent from Amazon and then you don’t have to lug it home on the bus every month. I haven’t gotten to that point but I might someday. (I either lug it home, have my roommate come along and carry half, or we get a Zipcar a couple times a year and stock up and take things to Goodwill and the dump). 1. Gouging people at trailheads and creating transit to trailheads is the last thing we should do. Our remote trails, often with extremely limited parking – often room for only 10 or 20 cars max – are so attractive, because they are so spread out and sparsely traveled. People who don’t care about solitude would do just as well at Discovery Park or Point Defiance, both served by transit, as a “remote” trailhead with Metro buses arriving every hour, especially if parking fees in the national forests were increased to an unaffordable rate, driving large numbers to those few trailheads with transit. A better suggestion would be to have better car rental options. There’s no reason why dense neighborhoods shouldn’t have an Enterprise or Hertz with late evening and all-weekend hours for this very reason. Car “subscriptions” are great when the cars are available, but sometimes an old fashioned rental is a better option for an all-day or a long weekend trip. 2. What is your suggestion for the 90 percent of Washington residents who don’t live in Seattle? Do you plan to provide transit from every county in the state to the trailheads with jacked-up parking fees? Or are we just supposed to eat the cost of your problem? 3. Groceries… ah, yes, the chicken and the egg. Get people out of their cars, first; or develop a sustainable infrastructure of neighborhood markets first. Unfortunately, we had that market network decades ago and made it die a long death from the 1960s through the 1990s. I remember riding my bike to neighborhood shops many times as a child in the 80s. (Run to the IGA and get 1 lb ground chuck, a gallon of milk, a loaf of bread, and a jar of sauce; or run to the bakery and get a package of rolls and four doughnuts; or ride your bike to the optometrist to pick up your new glasses. You get the idea. Lots of small shops close enough to make a 5 minute bike ride to get groceries easy.) One of these has to come first, and I’m not sure which it should be. Regardless, shopping needs to be seriously de-centralized. First thing id to end parking requirements and let the private sector decide how much parking it wants to provide and if it wants to charge for it or not. Pre-1950 Flxible. Idaho Falls to Salmon forty year ago. They even called the company a “Stage” line. Didn’t really need a road. Carried about fifteen passengers max, with room for a tractor engine and all their hiking gear. From uppermost transit terminal to above timberline, less solitudicide that fifteen cars, and also Historic Commission level of discomfort, noise, and dirt. But also think solitude anywhere in Earth’s atmosphere is has always been made-up. Short-headway buses to where the steep part stars. Where there’ll be a cafe, or restaurant in a picturesque place with a nice view, and people can relax carlessly, ’til it’s time to go back down to the intercity buses and cross country trains. Cars too- ’til people realize how slowly they move. Gouging? Have read that present Administration has deliberately raised park fees for two reasons. To keep anybody non-rich out. And also, fewer witnesses to watch oil-company infrastructure turn the dirtiest remaining oil into contributors’ rewards. Groceries? Anybody else remember when average neighborhood store always had at least a kid on a bike “deliver?” Airport to hotel- van or truck, not bike should leave a lot of LINK room available for bikes and people. Parking requirements should reflect the richness of the transit and the walkable environment from a location. At the 85th & Greenwood node there is more transit and more shopping within a walkable distance than there is at the 65th & Greenwood node. Theoretically, a typical person living at 67th and Greenwood will likely require more personal auto usage than someone living at 85th & Greenwood. Even if the person living at 65th St. doesn’t own a car they will still likely be using package delivery services, ride sharing services or meal delivery services–all of which generate road traffic and contribute to congestion. It would seem logical that any new construction at the 85th St. node would be better suited for zero parking requirements than new construction at the 65th St. node. What do you mean by “parking requirements”? In other words, who should pay for this parking? If you require new apartments to have parking, then renters — all renters — pay for that parking (whether they use it or not). That is because it pushes up the cost of construction (similar to a tax on development). Higher development costs mean higher rents (fewer developments at the margins, etc.). You could tax the neighborhood and put up parking garages instead. That would be a more just option. But here is a crazy idea — just let the market decide. The basketball courts are more crowded now that more people have moved into the neighborhood, but we don’t require new apartment buildings to have courts. Why is parking different? +1. I really don’t understand why this problem needs so much regulation. If you care a lot about parking, you should seek it out and pay for it. No one is precluding you from securing the amount of parking you need. If you care less, whether because you don’t have a car, don’t mind walking a few blocks, or whatever, then you don’t need to pay for it. Guy on Beacon … I think that you have a good idea here. 45th, 85th and Greenwood have two bus lines, and taller building there would make sense. The better public transit the higher some of the buildings, and the fewer required parking spaces. I think that the half mile rule from a transit stop might be better stated as about 6-8 minutes. On Greenwood we are about 12 minutes from the E bus, were it 3-4 minutes close we likely would use it frequently. It is a pretty steep will, and we are no longer young. I still think that a typical single residence block could well allow one 4 story four to six-plex per city block, developer to pay neighbors for the development rights. That would present some architectural problems. One or two units to a floor, elevator or no elevator and others. I think every urban neighborhood should have a diversity of housing stock. This building at 6726 with 57 units will likely have about 80 occupants which could create up to 80 additional cars parked on the adjacent streets. So, let’s put a couple of temporary restrictions on the building to make sure that the neighborhood doesn’t become “unlivable”. There should be a buffer zone around the building that would prohibit another zero-parking building within the zone until a parking survey is done that shows that the 6726 residents are truly living car-free and not just parking-cost free. After the 6726 building is occupied, SDOT can scan the license plates of the cars on the nearby streets at night. If the cars show as being registered to residents at 6726, then it would be pretty clear that the residents aren’t living car-free. If there are 30, 40 or 80 cars on the adjacent streets registered to 6726 then the residents are just refusing to pay for their cars’ overnight storage and no more of these buildings would be allowed in the neighborhood. If the cars on the nearby streets don’t show up as belonging to residents at 6726, then it’s more likely that the residents are living a sustainable urban lifestyle that doesn’t require a lot of personal autos and more zero-parking buildings could be built in the neighborhood. Problematic. If the neighborhood has a diversity of housing stock, why can’t it have a diversity of mobility modes? I don’t have a car and I would gravitate toward a parkingless apartment, especially if it cost less than other apartments. I’m meeting more and more people who don’t have cars either. So you’re right that an 80-person building could have a maximum of 80 cars, but that’s the extreme upper end. That’s like the requirements that force big-box stores to have enough parking for the biggest shopping day of the year — never mind that it’s empty 90% of the time. But there are other things store owners can do, like shuttle their employees from satellite lots to free up spaces for customers. The article says that an average of 35% of residential parking goes unused. Well, that means 20 of your 80 spaces. And it’s a reasonable assumption that micro-apartment residents are less likely than average to have cars, because they chose a dense urban village, or they’re lower-income than average, or they just moved here and are waiting to buy a house and car, or they just divorced and suddenly have to set up a new household. The reason the study found 30% of parking spaces were unused is because parking spots cost money and people wanting to save money will take their chances and try to find street parking. That is the problem with allowing parking to be charged separate from rent. But that doesn’t say that a person wouldn’t be willing to rent out one of those unused parking spaces if it were available. For every person who is looking for free on-street parking, how many people would be willing to purchase the right to park in a safe, secure and guaranteed location off-street? The bargain hunters will opt-out of parking costs, but how many people would prefer to have their cars safe and under cover at night? Letting off-street spaces go unused also contributes to higher rents. If off street parking is 95% occupied instead of 70% occupied, wouldn’t there be more revenue for building owners and less pressure to jack up rents? @Guy — Great point. I have an off-street, uncovered parking space. I would gladly pay to rent someone’s covered space and would either rent my uncovered space to someone less concerned about covered parking or, short of any takers, use it for raised beds and raising vegetables. That accounts for some of it but not all of it. Some people don’t have cars, more than the public perception. Especially those who live in TOD like Othello, where they moved there so they could ride the train and not have the burden of a car. That could easily account for the 30-35% empty spaces. There’s no space on the street for twenty additional cars in the surrounding few blocks. The existing houses already filled up over half the spaces (and eliminated many potential spaces because of their driverways), so there were only five or ten spaces left. So while some people live in apartments and park on the street, it can’t be many of them because there simply aren’t that many on-street parking spaces. In that case, the root of the problem is that street parking is too cheap. If street parking cost as much as a private garage, people would pay for the garage. They didn’t seem to charge for street parking where I stayed in Potsdam, but there wasn’t much of it. There were a few apartment buildings down the street with big parking lots but most didn’t seem to have this. Apparently there is a big shopping mall on the southeast side of town with a big parking lot. As best as I can tell, the way it works there is, if you want to live in a place with parking, then that is where you live. If you don’t need parking, then you live in a place that lacks parking. Of course, in their case, this building would be considered way outside town and the non parking buildings would exist within a 20 or so minute walk of downtown – or in the case of Babelsburg a 3 minute trip on the tail end of the S-bahn. Anyone here ever use this parking calculator developed by the Center for Neighborhood Technology (CNT), in collaboration with King County Metro Transit? I have played around with it a bit and would love to get some feedback from others as to the validity and reliability of its data. Great! Cities shouldn’t force developers to build extra parking they don’t need. It’s great to see more places are building options for people without cars. We dont’ know what the actual rent price would be per unit when it opens, but what we do know is when developers are not burdened with building housing for motor vehicles, they can build more housing for humans (either more units, bigger spaces) and the cost per unit can be a lot lower without the need to build, say, underground parking at $40,000 a space. Cities should not tell developers how to run their business in regards to motor vehicle storage. Whether a commercial space, mixed-use or 100% housing being built anywhere, the developer who has this huge investment in the success of the property, should decide for themselves how much parking they need. Current residents, employees, shoppers in a given area get used to getting something for nothing–free motor vehicle storage, making it super easy for them to continue to drive a car everywhere they go. It’s wonderful to see those deeply embedded incentives, even subsidies, steadily being chipped away. There are also a number of projects I’ve seen where it would be impossible to fit parking on-site or where requiring parking would severely limit the number of units. A good example is the 7 story tower proposed for the corner of Roosevelt & 65th NE. In First Hill…underground parking in my building is going for $150/month (with tons of unoccupied spaces), zone street parking is around $3 per month. If the city ever wanted to raise revenue they could increase the zone price tenfold and I would still happily pay for it. Everyone is enjoying the discussion about parking, but the gist of the story is that Seattle is trying to define down ‘frequent transit’ rather than actually increasing transit. I hope I’m not alone in thinking that is just lame. Seattle is closing an unintended loophole that requires developers to include parking if the 15-minute corridor route can’t stay on time. The city is not deprioritizing frequency: Prop 1 is what created the 15-minute evening frequency on the 5, and both the city’s transit master plan and Metro’s long-term plan intend to bring frequent transit to most of the city. The issue is not the city deprioritizing frequency, but what’s the reasonable cutoff to require parking? The city says 15-minute unreliable service is enough to omit parking. You may or may not agree with that threshold (and that’s worth talking about), but it is a reasonable starting point. And realistically the city can’t go higher right now because it can’t afford more frequency and it’s afraid to take away street parking, so if you insist on a higher-frequency threshold then then net result will be limiting parkingless buildings to a very small area. That’s not the way to move forward into less car dependency. We’ve way overbuilt parkinged buildings: almost 100% of the buildings built since the 1930 have 1:1 parking except for the few that qualified for the recent exemptions. So there are literally parking-rich apartments everywhere, but no parkingless apartments for those who want to live closer to the neighborhood and have a potential $200 reduction in rent. Mandatory parking is a significant factor in why people can’t afford to live in Seattle any longer and are being displaced. The solution is more small apartments without parking, because both those factors will minimize costs. Have to say that as a person nearing 60 years of age who has not fared well with body part longevity, I’m willing to be that most of the folks commenting here with thoughts of living with out cars are far younger than I am. Not only do I want to have my car to drive to the things I need to get to, I don’t feel all that safe negotiating long walks or transit at night. Just saying, any solutions need to take into account ALL residents, not just the younger folks or those who nature has blessed with active longevity. FFS. Parking is not a right. If I want off-street parking, I’ll pay for it. If I want a 2/1.5 instead of a 2/1, I’ll pay for it. If I want a garage or basement workshop space, I’ll pay for it. If you want a place to park your car, PAY FOR IT. How about no on-street parking. If you can’t share like an adult, take it all away.